The "Universal Soldier" franchise has endured its fair share of hard knocks since the release of the original 1992 film -- 1999's "Universal Soldier: The Return" being a prime example of unimaginative producers and subpar filmmakers squashing the potential out of a rather bizarre premise. Nearly 20 years later, someone, somewhere convinced Jean-Claude Van Damme and Dolph Lundgren to reteam (I assume using a sweet paycheck as bait) for "Universal Soldier: Regeneration," a DTV sequel that's disturbingly competent and utterly entertaining. The picture doesn't retain the sweaty, cartoonish attitude of Roland Emmerich's original picture, but as superfluous sequels aimed at the bottom-shelf market go, "Regeneration" is startlingly well-crafted. A vicious terrorist group has kidnapped the children of an Eastern European Prime Minister, holing up in the abandoned remains of the Chernobyl nuclear power plant, threatening to detonate the radioactive site if their political demands aren't met. With traditional armies failing to defuse the situation, the government resurrects the "UniSol" program with a new team of programmable warriors, now stronger than ever. However, on the loose is a rogue "Next Generation UniSol" (NGU) monster (Andrei "The Pit Bull" Arlovski), who shuts down every last rescue attempt. Desperate, the government brings in retired UniSol operative Luc Devereaux (Jean-Claude Van Damme) to help, reprogramming him for war. Off to save the day, Luc discovers old nemesis Andrew Scott (Dolph Lundgren) has been cloned and set loose from his mind-control prison, complicating the rescue mission at hand. For what is was, "Universal Soldier" was a proficient action distraction, made at the apex of Van Damme's popularity and utilizing Emmerich's scrappy mid-budget touches to pleasing effect. However, it wasn't exactly the stuff of Masterpiece Theater. It was junk food cinema that managed to scrape up some profit and a loyal following, but seemingly generated little interest from the studio to expand on the concept with a few turbulent theatrical sequels. Though it has every right to ignore the past, "Regeneration" bravely positions itself as a sequel to Emmerich's picture, ignoring the events of the 1999 installment and whatever nonsensical DTV experimentation when on before that. Screenwriter Victor Ostrovsky merely nudges the fierce UniSol concept into a desaturated new world order of international terrorism, toning down the overt sci-fi touches to play up the cold-blooded, fast-fist nature of the UniSols, spending a substantial amount of screentime exploring their icy killing machine mentality. Thankfully, Ostrovsky doesn't contemplate matters too extensively, intentionally skipping a juicy opportunity to flatten the characters and reimagine every single corner of the concept. The "Regeneration" story is simplistic and comfortably volatile, merging an updated cinematic approach with classic "Universal Soldier" figures in Van Damme and Lundgren. Of course, the gruesome twosome only make something of a cameo appearance in "Regeneration" (Lundgren enters and exits the picture in a hurry), which is disappointing, until it registers that director John Hyams (son of Peter Hyams, here as the film's cinematographer) is a rather inventive action filmmaker, cramming the picture with briskly choreographed stunt set-pieces and plentiful poundings. Hyams employs the frigid Bulgarian locations smartly, offering the violence a hostile industrial playground -- a base of operations that covers his behind in the budget department, but remains vivid enough to make a stylish impression, handed a Carpenteresque synth score to rile up the atmosphere. "Regeneration" is rough and ready, moving swiftly from skirmish to skirmish, with Van Damme released in the final act to show the kids what a real action star looks like (slightly wrinkly and dour, but eager to distribute some wall-smashing beatings). The picture retains surprising value, making it a welcome blood-spattered raft of quality floating in a sea of horrendous DTV product. "Regeneration" is moody, pleasingly quick-draw, and knows when to quit, making the "Universal Soldier" brand name bizarrely vital once again. 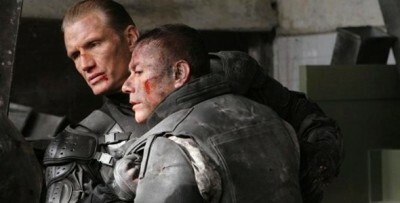 Buy tickets to "Universal Soldier: Regeneration" now!